For the wealthiest people in the world, the real estate market is searing. The number of Ultra High Net Worth (UHNW) individuals is increasing, and they like to scoop up more and more properties all over the world. 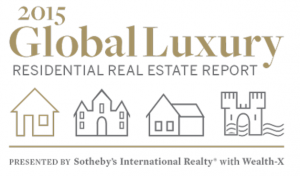 In order to clarify and analyze trends, Sotheby’s International Realty recently published a study in which they looked at the real estate spending habits of the global population of UHNW individuals. Titled The Global Luxury Residential Real Estate Report 2015, the study analyzes 211,275 individuals in the world with net assets of $30 million or more. A UHNW individual owns multiple properties. On average, a UHNW individual will own 2.7 residential properties; 79% own two or more, 50% own three. Secondary residences tend to be 45% more valuable and twice as large. The United States is the most desired country for real estate. New York City shows to be the most popular area as it claims the highest number of UHNW-owned residences in the world. Besides access to business hubs, the U.S. boasts a high standard of living and excellent education opportunities. Real Estate assets are important for women. UHNW females hold 16% of net worth in real estate compared to 10% of men. Females tend to hold onto their properties longer, almost twice as long as men. These trends allow just a small glimpse inside the intriguing and comprehensive study. Insights into the UHNW consumer and where and how they spend their money are fundamental to understanding major factors in the real estate market. This study was done by Sotheby’s International Realty in conjunction with Wealth-X, a world leader in UHNW research and prospecting. Want to know more on Ultra High Net Worth individuals? Who are the most significant groups to watch? Which markets are emerging, and why? Please leave your name and email. Leave your name and email and we'll send you a copy of the study. My business has definitely benefited this past year from UHNW clients. When they move into a property whether primary or secondary they are very likely to want an Organizer to help them unpack so that they are organized from day one.